Wesseling, P, Hemker, P.W, & Oosterlee, C.W. (2008). Editorial on three special issues (Vol. 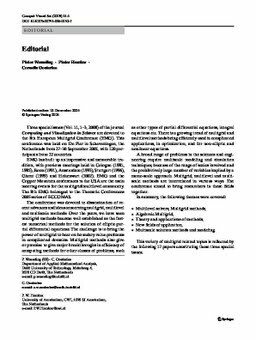 11, 1–3, 2008) of the journal Computing and Visualization in Science devoted to the 8th European Multigrid Conference (EMG). Computing and Visualization in Science, 11, 1–1.